Posted by admin in activity reports, Chile, Villarrica. Buenos Aires VAAC (home page; message archive) issued three advisories on 4 and 5 September 2010 reporting emissions from Villarrica volcano in Chile: on 4 September a thin ash plume, very light, was identified extending 60 nautical miles NE of the volcano (4 September 2130Z), and on 5 September continuous emission was reported, although it was noted that low clouds were hampering observations (5 September 0500Z). In each case the source of the information was GOES-12 satellite data. No further reports have been issued, and this activity remains unconfirmed. Posted by admin in activity reports, Chile, Llaima, Villarrica. The Chilean state geological service SERNAGEOMIN carried out an overflight of Llaima volcano on 4 March, and in the light of the observations made have raised the alert level for Llaima from Yellow Level 3 to the slightly higher Yellow Level 4. A bulletin issued on 5 March reports that there has been no major change in the activity or morphology of Llaima since the last analysis on 21 February (although the rate of gas emissions, mainly sulphur dioxide, has increased), there have been large rockfalls on the slopes and some cracking of the ice on the northern and northwestern flanks, ‘possibly due to the powerful movement generated by the earthquake of 27 February 2010). The bulletin also suggests that swarms of tectonic quakes near Llaima have been caused by the fault system responding to the 27 February earthquake. Within the volcano, ‘an increase in the amplitude and duration of seismic activity (tremor)’ , and seismic signals ‘suggesting movement of fluids through minor cracks of a superficial character’, have been detected since the afternoon of 4 March. This seismic activity has led SERNAGEOMIN to raise the alert level to Yellow Level 4, and to recommend an exclusion zone of 4 km radius aroud the volcano. ONEMI have more details of the alert level for Llaima and the surrounding area in a bulletin issued today. Posted by admin in activity reports, Chile, Villarrica, volcano monitoring. 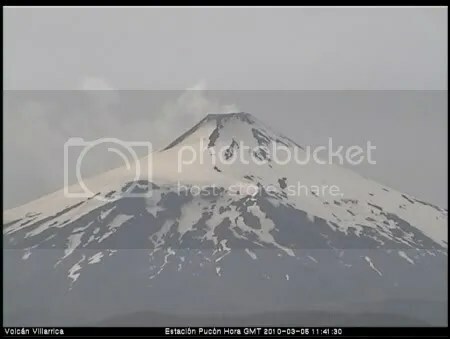 Villarrica volcano from the Pucón webcam, 5 March 2010 (OVDAS). The icecap on Villarrica volcano showed some new cracks and fissures on the flanks of the principal cone near the summit, caused by the 27 February earthquake, although the dimensions were smaller than those routinely present in the icecap. In addition, some small falls of ice were observed on the south flank and a small snow avalanche on the north-west flank. 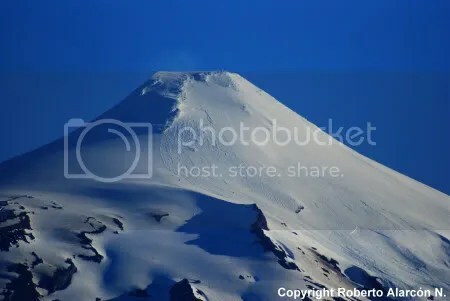 In the upper part of the cone of Villarrica volcano and on the north, north-west and west flanks abundant falls of rock from the summit onto the icecap and, locally, on escarpments of the flanks. In the case of Mocho volcano, small cracks were observed only on the south-east flank of the cone, the rest of the icecap showed no changes. The OVDAS Pucón webcam shows Villarrica producing a faint fumarole this morning (see picture above). Posted by admin in Chile, Llaima, Villarrica. Many thanks to Boris for this information, which I had completely missed (like Boris, I never visit the OVDAS homepage if I can avoid it, as it’s such a horrible headache-inducing mess). Posted by admin in Chile, natural hazards, Villarrica. Villarrica volcano in Chile, one of the country’s most active volcanoes, is popular among walkers and climbers, who come to the Parque Nacional Villarrica to enjoy the beautiful scenery and (when Villarrica’s activity allows) the challenge of ascending the 2,847-metre volcano’s slopes. But a volcano does not have to be erupting to be dangerous, and Villarrica certainly has its dangers. On Saturday 2 January a snow avalanche struck a party of tourists who were climbing to the summit crater, leaving one Brazilian tourist seriously injured and a number of his companions slightly hurt. The avalanche, reportedly 100 metres in width, occurred in good weather conditions and took the party (and their mountain guide) completely by surprise. This is the first time such an avalance, apparently caused by unstable snow cover slipping on the underlying ice, has caused problems at Villarrica. In response, the park authorities closed the slopes to tourists pending a detailed survey of snow and ice conditions on the volcano. The picture above (copyright Roberto Alarcón N.), kindly submitted by Werner Keller of Proyecto Observación Volcán Villarrica (POVI), shows Villarrica on 2 January 2010 following the avalanche referred to above and two further avalanches; the scars are clearly visible in the snow. The avalanche struck the tour party at around 2000 metres a.s.l., having descended about 600 metres, accumulating loose volcanic debris on the way. The front of the avalanche lobe was 2-3 metres deep. More information can be found at the POVI website. Posted by admin in activity reports, Chile, eruptions, Villarrica. The Volcanism Blog has received some images of the recent phreatomagmatic activity at Villarrica volcano in Chile from our friends at the Proyecto Observación Visual Volcán Villarrica (POVI). The first two pictures show the eruptive activity on 26 October 2008, the third is a panoramic view of the summit showing pyroclastic material covering the inner crater. Above: Villarrica volcano, 26 October 2008, 20:23 (POVI). Above: Panoramic view of the summit of Villarrica volcano, 27 October 2008 (POVI). In addition, a time-lapse video from POVI of the ash emissions of 26 October is now available on YouTube. Many thanks to POVI for these images, and for their continuing coverage of Villarrica. The year 2008 has so far been a quiet one for Villarrica, one of Chile’s most active volcanoes. Its most recent eruptive episode, which began in August 2004, ended around Christmas 2007 and there has been no significant activity since, making the last ten months the most prolonged period of inactivity at Villarrica since 1998. However, reports from Chile indicate that the volcano may be stirring once again. The Proyecto Observación Visual Volcán Villarrica (POVI) website reported two significant phreatomagmatic explosions on 26 October which deposited a layer of pyroclastic material several kilometres long on the eastern flank of the volcano. A news report at 123 Chile adds that a 200-300m plume was released during this episode which drifted eastwards, towards Argentina. ‘For the moment’, the report continues, ‘no incandescence has been detected at the summit and the seismic activity that would warn of any eruptive episode remains at normal levels’. El Mercurio calls the plume ‘thick’, while La Segunda reports that the plume was grey in colour, indicating high ash content. The government emergencies office ONEMI describes the activity as ‘within normal parameters’. At the moment the view from ONEMI and SERNAGEOMIN is that this is small-scale activity and there is no need for any alarm, but monitoring of the volcano will be maintained at an enhanced level.